There are few studies that investigate how people personally affected by a chronic disease associated with cigarette smoking account for their illness. Chronic obstructive pulmonary disease (COPD) is a respiratory condition largely caused by cigarette smoking. In order to better understand how people diagnosed with COPD view the relationship between cigarette smoking and their illness we conducted semi-structured interviews with 19 participants. We found a widespread scepticism among our respondents about medical attempts to link their illness with cigarette smoking, and doubts about whether their illness was in fact COPD at all. Only four participants described smoking as the principal reason why they had developed breathing problems. Most participants gave multi-causal accounts that emphasised explanatory factors such as a familial tendency to respiratory illness or workplace exposure to pollution. 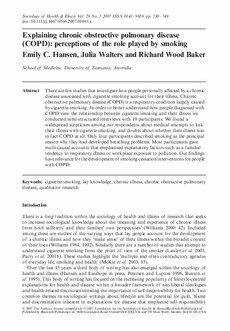 Our findings have relevance for the development of smoking cessation interventions for people with COPD.